ACN has a proven track record of delivering sport for development and youth work consultancy and training in Sub Saharan Africa, South East Asia and the Middle East. Each piece of work is bespoke and in response to local need. ACN specialise in working with communities coming out of conflict, who are working with youth using a range of activities to build stable, cohesive and peaceful communities. ACN’s international work aligns closely to the 2015 Sustainable Development Goals. Key goals fit with our model and our proven Theory of Change, demonstrating the journey of a young person through a sport for development programme. For example, “Goal 1: End Poverty” relates to the personal development part of a young person’s journey. This is where transferable social, employment and life skills practiced throughout the sports engagement sessions, lead to improved well-being, economic participation, productivity and resilience. Many of the goals such as Gender Equality, Quality Education, Reduced Inequalities and Inclusive Societies, are promoted via youth leadership programmes and capacity building training. 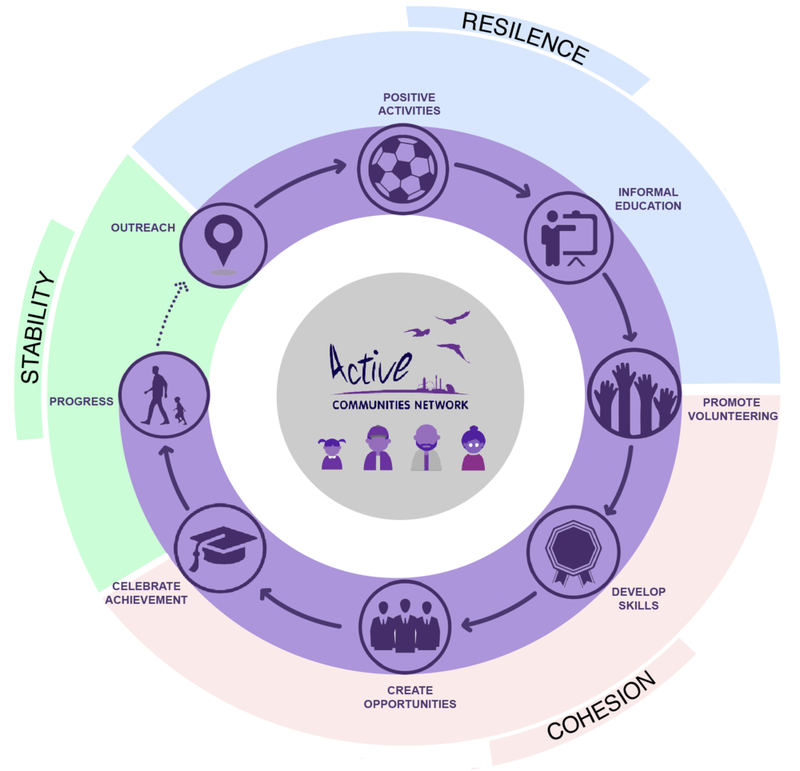 See model below as to how the SDGs relate to our resilience, stability and cohesion curriculum. ACN’s International work follows a simple process: an initial scoping visit and needs analysis of the project followed by an action plan and recommendations around training interventions that focus on workforce, community engagement and project management. The final piece involves overall evaluation and onward recommendations. This qualification is aimed at those who are already working with young people in communities and requires learners to demonstrate more in depth understanding of topics such as issues faced by deprived communities, partnership working, building resilience in young people, volunteer management and measuring impact of community projects. Download a full copy of our brochure outlining the International work to date and an extensive training curriculum. For any information regarding the international programme please submit a message below and our team will get back to you as soon as they can. Thank you for sending your message to us. One of the team will get back to you shortly. “In our Strengthening Resilience project in Tripoli, we targeted 250 young people across different vulnerable areas in North Lebanon, some of whom were involved in civil war and fighting. ACN delivered training to community coaches representing NGOs in Tripoli.